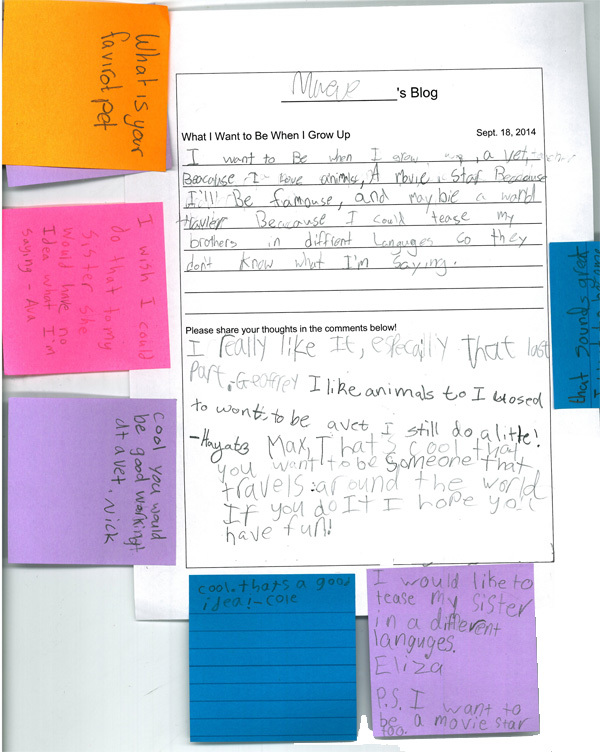 My third graders have started blogging! As part of our efforts to connect to other students through the Global Read Aloud, I introduced the basics of blogging, and students have officially launched their own blogs via KidBlog. This post lays out the steps I took when introducing blogging to my students, as well as links to some of the many wonderful articles out there that helped me get started. 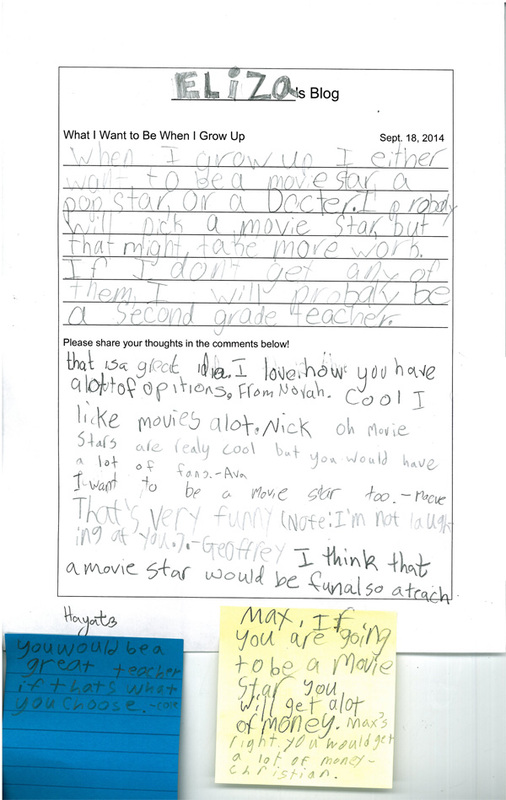 Given their lead, I also started by having students write and learn how to comment using paper blogs. 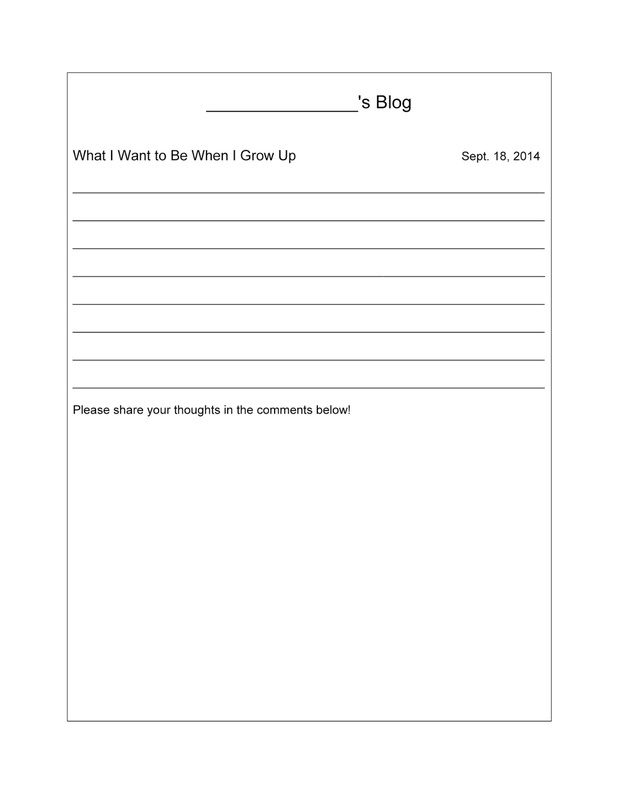 I designed a simple blog format (above) around the question of "What do you want to be when you grow up?" I figured that this would be a topic that would give students a wide range of things to talk about and one that would encourage discussion and conversations among the comments. Student wrote out the 'post' parts of their blogs and had the option of adding designs the border as well. The day the paper blogs we due, we all gathered around and watched this video by Mrs. Yolis's third graders on How to Write a Quality Comment (H/T Franki at Click Here Next). Students left their paper blogs out at their spots and armed themselves with post-its for commenting, once the blogs ran out of space. We rotated around the room quietly, allowing everyone time to read and thoughtfully respond to their classmates' posts. I was very impressed by the quality of their comments and how thoughtful and encouraging many of them were to each other and their ambitions for the future. The next week, we kicked off our first actual blog posts by sharing book recommendations. Students were given a handout with the basic outline for writing a book recommendation, as well as a step-by-step introduction to using KidBlog. I also posted both the outline and an example book recommendation post on my KidBlog account. An email was also sent home to parents inviting them to set up parental accounts and leave comments too. It took a few tries before most students were comfortable navigating to KidBlog, finding their accounts, entering their passwords, and knowing where to go next to work on their posts or to start reading and writing comments, but by the end of the week, many students were confidently zipping through, exploring the customization options, and volunteering to help each other solve problems. The book recommendations were an immediate hit, and we quickly started a new bucket in our classroom library to house copies of books that had been recommended. (I also have a growing list of other titles to try and add to our collection.) Students were very enthusiastic about seeking out their classmates recommendations or sharing their enthusiasm for books they had already read. I think this effort will really help us continue to grow and see ourselves as a community of readers too. Looking forward to seeing how we continue to grow in our "virtual" community as we learn more about blogging and about each other. Have any questions or advice on student blogging? Please share in the comments below.